The United States and China resume talks Tuesday aimed at ending a fight over Beijing's technology ambitions ahead of a deadline for a massive U.S. tariff hike. 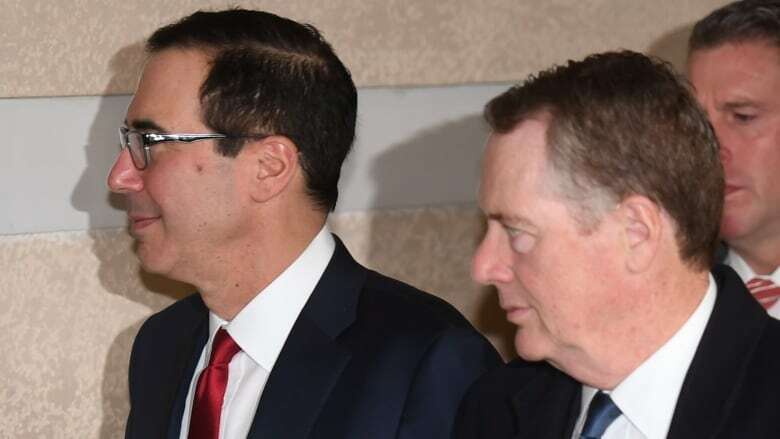 On Thursday, Lighthizer will lead higher level talks, joined by Treasury Secretary Steven Mnuchin, Secretary of Commerce Wilbur Ross, White House economic adviser Larry Kudlow and trade adviser Peter Navarro. Leading the Chinese team will be Vice Premier Liu He, according to the Xinhua news agency. Business groups and economists saw Friday's surprise announcement of further talks this week as a sign that the two counties were making progress. Both governments have expressed optimism, but they have given no details of their talks. Economists say the time available for negotiations is too brief to resolve an array of irritants in U.S.-Chinese relations. They say Beijing's goal is to persuade President Donald Trump they are making enough progress to push back threatened U.S. penalties. Beijing hopes for "a mutually beneficial and win-win agreement that is acceptable to both sides," said a foreign ministry spokesman, Geng Shuang. Without an agreement, a 10 per cent tariff increase imposed on $200 billion of Chinese goods is due to rise to 25 per cent on March 2. Last Friday, Lighthizer told the Chinese president, Xi Jinping, the two sides "made headway on very, very important and difficult issues." Trump imposed the penalties over complaints Beijing steals or pressures foreign companies to hand over technology. The talks also include complaints about Beijing's plans for government-led technology development, cyberspying and China's trade surplus. Beijing retaliated with higher duties on U.S. goods and told its importers to find other suppliers. That led to a 40 per cent drop in Chinese imports of American goods in January. Washington, Europe, Japan and other trading partners complain plans such as "Made in China 2025," which calls for government -led creation of global competitors in robotics and other technologies, violate Beijing's market-opening obligations. China's leaders have offered to narrow its multibillion-dollar trade surplus with the United States by purchasing more natural gas, soybeans and other exports. But they are resisting pressure to scale back industry plans they see as a path to prosperity and global influence. Other stumbling blocks include Chinese resistance to U.S. pressure to accept an enforcement mechanism with penalties to ensure Beijing carries out whatever commitments it makes. Trump said last week he might be willing to push back the March 2 date if the talks go well but Washington has yet to say whether the negotiations are making enough progress.